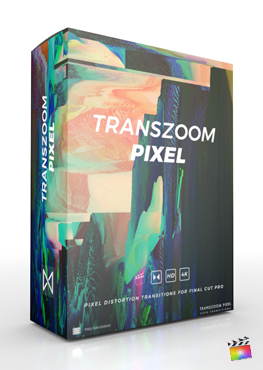 Create quick computer glitch transitions with TranShiver from Pixel Film Studios. With 45 professional malfunction transitions For FCPX, you can pixel shift and shiver your way from one clip to the next. TranShiver transitions will give any scene a more kinetic, fast paced feel. Add a computer damage effect without having to break your monitor. With the Damage transitions you can blur and shiver your way from one scene to the next without overly distracting your viewer. Using many popular contemporary films as inspiration, TranShiver’s Malfunction Transitions were professionally created to add a futuristic chaos to your footage through scan lines and color separation glitches. Give the illusion that your footage is being transmitted from the Mars Rover with the Pixel Shift transitions. With randomized pixel blocks and scan lines, this transition is a great way to give your footage a Sci-Fi vibe. Where do I find TranShiver? Once the installation is complete, you can find TranShiver in the FCPX Transition library.